Activation Children provide sand from a favourite beach to be melted into several enamel charms and they then select their favourite charm and wear it during exams. Alice Whish is one of a distinctive group of Australian jewellers who have come from a rural background in New South Wales. Her work continues to have a strong connection not only to the wide brown land, but also the sky above it. In recent years, she has worked with women in north-east Arnhem Land on collaborative jewellery projects. She holds a Bachelor of Visual Art from Sydney College of the Arts, Sydney University, a Master of Art, Fine Art in Gold and Silversmithing from RMIT and a Master of Higher Education from the University of New South Wales. 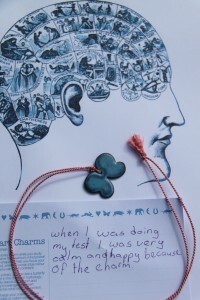 Smart Charms are pendants for children sitting NAPLAN exams – a national program of standardised assessment in the Australian education system. To activate these pendants, children must collect sand from their favourite beach. They then choose one of several shapes – brain, butterfly and heart. In due course, they receive a pendant on which the sand has been fused, forming a lovely tactile surface. These charm pendants are to be worn when studying or sitting for an academic test or exam. The charm works by calming the owner perhaps to breath and not to panic to touch the charm when overwhelmed and perhaps clear thought might develop just when they thought they had nothing to write in the examination. Its power for the child is to feel cared for resourceful and strong. Works for us uni students also! I wear one right along with my children. Reminds me ‘I can do this’ to trust in my own ability and my own mind. Beautiful, thoughtful pieces I am proud to wear. It really works! During Naplan I found questions easier. I was fiddling with it through the test and my mind felt clear. Bring on the tests !! !